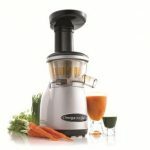 What Are The Centrifugal Juicers Advantages & Disadvantages? Crunch & Fizz > Juicer Types > Centrifugal Juicers > What Are The Centrifugal Juicers Advantages & Disadvantages? 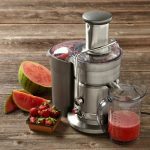 If you are looking for Centrifugal Juicers Advantages & Disadvantages, it means you are very close to purchasing one but aren’t too sure if it is the right choice for you so allow us to give you a quick snapshot of this juicer type. Centrifugal juicers are among the popular juicers of the modern world. Basically, they are used to extract juice from fruit or vegetable pulp. The centrifugal juicers advantages & disadvantages are tied to their mode of functioning. Picture how a washing machine works by spinning to remove water from wet clothes. The centrifugal juicer essentially does the same. But first, the juicer chops up the ingredients into very small pieces before spinning them. 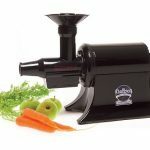 To rip up the fruits and vegetables, it uses a flat cutting blade that has extremely sharp triangular protrusions. The blade and basket then spin at very high speeds (averaging at 5000 RPM), to separate the juice from the pulp. The juice passes through the strainer basket and collected in a container outside the machine. The pulp is held back to be removed later. As you can see, it’s a simple, effective mechanism. Therein lays the pros and cons of the centrifugal juicer. Of course its outstanding advantage is that it’s fast. Whether you’re making juice for huge crowds or you want to have that refreshing drink just before work, it is the juicer for you. The juicers usually have a big mouth. This means that you need not spend time cutting up the fruits or vegetables before you put them into the juicer. It is fast and saves you a lot of time. Next is its availability. 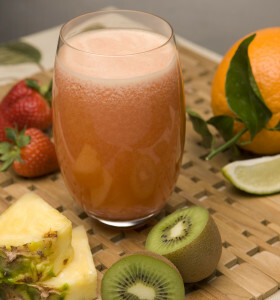 It is one of the most common and popular juicers around. This means you can find it in most department stores. With the popularity comes variety in brand and cost. 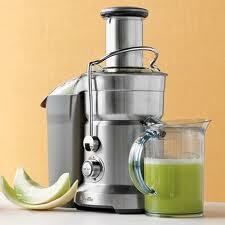 The centrifugal juicers come in different types for you to choose from. You get to go with the product that satisfies your taste and budget. 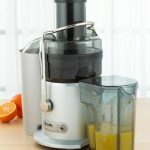 No one wants a juicer that is difficult to clean. Cleaning centrifugal juicers is a breeze. They have fewer parts and you can toss most of them into the dishwasher or clean them off yourself. In addition, mastering how to use them is an easy process. They can be used by anyone from beginners to experts. Some centrifugal juicers come with pulp ejector that automatically removes pulp when it fills the strainer, thus saving you time. It’s a neat and convenient little trick. Are you afraid that the pesticides in fruits and vegetables will mix with your juice? With centrifugal juicers, you need not worry. Part of the beauty of the centrifugal process is that it separates the pesticides from the juice. However, this is not an excuse to avoid washing your fruits and vegetables. What about the enzymes in the fruits? Are they affected by the friction of the high speed centrifugal juicer? The enzymes are not damaged. In fact, scientists have proven the contrary. The high speeds actually increase enzyme activity. That is another plus for the juicers. Everything has its ups and downs. After all, nothing man ever builds is perfect. Let’s look at the cons of centrifugal juicers. When you produce juice at those high speeds, you are not assured of extracting all the juice from the fruits and vegetables. In addition, the juice produced may have foam. The disadvantage of centrifugal juicers that stands out is the noise they make. The internal components revolving at high speeds increase friction, which increases vibration, making them noisy juicers. At the end, these juicers promise to give you healthy and tasty drinks. 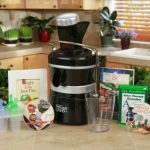 After you consider the centrifugal juicers advantages & disadvantages, you’ll be able to decide whether you’ll get yourself one.